George Motz is America’s foremost hamburger expert, the host of Travel Channel’s Burger Land, the director of The Food Film Festival, and author of Hamburger America, a guide to 150 great hamburger joints. He has also eaten more burgers in more places than you. George has new cook book coming out on April 12, 2016 called “The Great American Burger Book.” It’s more than just a list of recipes and Burger builds. This book is for the intense Burger lover who really wants deep insights on how to not only how to cook a Hamburger patty to perfection but also the other elements that make Very Best Burger. 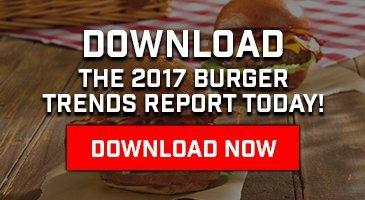 You’ll learn how to prepare outstanding bacon, the best way to toast a bun and more expert Burger chef insights. We asked George to share a recipe from the book with us so you could get an idea of what to expect. We hope you’re hungry! All the photos on this post are found in the book and are courtesy of George Motz / Kristoffer Brearton. Sometimes biting into a big, juicy burger is what you crave, but for the most part the burgers of our forefathers were not like this. In the first few decades following the appearance of the hamburger in America, it remained small and smashed thin on a flat top, making for crisped edges. Although this method produced a profoundly tasty burger, the one thing it lacked was the copious juices you might find in, say, a steak. The best pub-style thick patties come from bars that have a tiny flat top, in certain cases still located near or just behind the bar to quickly feed tipsy patrons. Some of the best I’ve ever had were thick, hand-pattied beauties that were just about the only thing on the menu (other than alcohol). Places like The Mo Club in Butte, Montana, and Paul’s Tavern in Dubuque, Iowa evoke a simpler time when the burger truly was an egalitarian meal and the poor-man’s steak. But it’s New York City that leads the pack in pub burgers per capita. There are still many pubs in the five boroughs peddling nothing more than burgers and booze, some of them over one hundred years old. In my opinion, the best pub burger experiences can be found at New York City classics such as J.G. Melon, P.J. Clarke’s, and Donovan’s Pub. All of these burgers have a few important things in common—they are all hand-formed, cooked on a flat top griddle, and left untouched while cooking. And unlike the griddle-smashed classic, these burgers are seared like a steak to create a tasty griddle char that seals in those precious juices. With the right elements you can create a burger that tastes exactly like a juicy steak. And since the true taste of beef will dominate, this would be a good time to experiment with different cuts of beef blended into the grind. 80/20 fresh-ground chuck is the call, but if you’re grinding your own, you should consider adding a small amount of short rib, brisket, or rib eye to make the flavor profile more complex. Now that’s something you can’t do with a steak. Seasoning is also key when making the thick pub classic. Salt and pepper are staples for a reason—simplicity allows the beef to shine. Please resist the misguided temptation to put things into your ground beef like onions, eggs, and spices. Unless of course meatloaf is your endgame, or the Cuban Frita, a very different type of burger. I recommend seasoning only the outside of your burger just moments before the patty hits the griddle. Note: This burger will create a good amount of smoke and airborne grease. Be sure you have a functioning vent/hood over your stovetop or be ready with some open windows. Divide the beef into 4 equal portions (8 ounces/250 g each). Add a few drops of peanut oil to the cast-iron skillet, using the spatula to spread the oil, and crank it up to medium-high heat. When the pan just starts to smoke, it’s ready. At this point, and not before, season both sides of the patties with a liberal amount of salt (and pepper if desired). Salting too early will bind the muscle fibers together and make the burgers tough (not good). Place the patties in the hot skillet—they should sizzle loudly when they hit the pan—and cook for 5 minutes without disturbing them. The goal here is to sear the burgers, sealing in the juices. When you see red liquid start to form on the uncooked surface of the burger, it’s time to flip them. Reduce the heat to medium and cook the second side for an additional 5 minutes (do not disturb them while cooking). With about 1 minute to go, add two slices of the cheese to each patty and cover with a large domed lid or small metal bowl. Remove the burgers from the heat and allow to rest for 1 1/2 minutes. The internal temperature of the burgers should be about 143°F (62° C) for medium-rare. Transfer to toasted buns and serve with mayo, lettuce, sliced tomato, onions, bacon (if using), and pickles on the side. We’ve hand selected George to be one of the official judges for the 2016 South Beach Wine & Food Festival® Amstel Light Burger Bash presented by Schweid & Sons and hosted by Rachael Ray.